Cyber Liability Insurance | Shared Alliance Insurance, Inc. Whether your business is a one-man shop or you have 500+ employees, you have a data breach and cyber liability risk. The question for you is, how are you going to respond and what financial implications will your business face when this breach occurs? At Shared Alliance Insurance, Inc. our commercial insurance experts, led by Zach Bartness, can help your business weather the storm when a data breach occurs. A robust cyber insurance policy and data breach response plan can help reduce your exposures and assist you in weathering the storm when this breach occurs. Most general liability or business owner’s policies exclude or limit coverage for cyber liability and data breach response coverage. This means you need to find a qualified expert to help endorse your current coverage or find the proper stand-alone cyber insurance policy to protect your business’s needs. Shared Alliance Insurance, Inc. is your one stop shop for cyber insurance protection. We offer products from the top carriers in the market place that will protect your business with coverages such as cyber liability, privacy liability, privacy regulatory claims coverage, security breach response coverage, security liability, multimedia liability, cyber extortion, business income and digital asset restoration, PCI-DSS Assessment coverage, and cyber deception coverage. 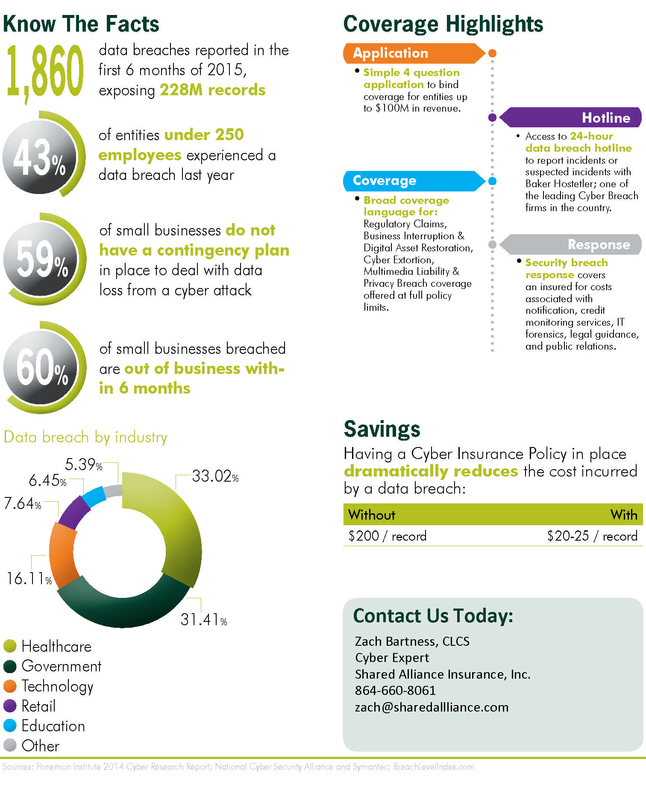 If you or your company has employees, computers, processes credit or debit card payments, offers web sales to clients, or has personal identifiable information on your network you need a cyber insurance and data breach response plan! Avoidance, inaction, or ignorance has been held up in court as no excuse for protecting private information. We team up with IT experts in the industry that can help us determine the right amount of coverage by doing vulnerability scans and tests on your networks. Call us or contact us today for your personalized Cyber Liability and Data Breach Response Plan. Request a Cyber Insurance Quote by filling out the information to the right above. For an additional $450 premium, the Cyber Deception extension provides coverage for the intentional misleading of the Applicant by means of a dishonest misrepresentation of a material fact contained or conveyed within an electronic or telephonic communication(s) and which is relied upon by the Applicant believing it to be genuine. This is commonly known as "spear-phishing" or "social engineering". Please note that the Cyber Deception Coverage ONLY applies to Money or Goods of the Insured and will NOT apply to Money or Goods of a Third Party (Customer) held in their Care Custody and Control and released to others.